Where are you based? We are based in the overwhelmingly amazing city of London! Why was ConsciousTee founded? We are passionate about spreading good vibes through minimalistic, fun, and quirky t-shirts. Being conscious about your actions is empowering and ConsciousTee was funded to do just that; empower individuals around the world to live their best lives by being kind to the animals, the planet, themselves and fellow humans. We want to create simple t-shirts that empower you to do more than simple things. When will my order be packed and shipped? We operate on a made-to-order basis, which means that your conscioustee will be made after your order is placed. This usually takes 3-6 working days. After that we aim to pack and ship all of our orders within 1-3 working days. How long will my order take to arrive? I just can’t wait! After your tee is made (which takes between 2-5 working days), we ship it for you and how long it takes for it to arrive depends on where it is shipped to. The following are an estimate. For the UK, it takes 3-6 working days and for the EU, 5-10 working days. Other European countries and rest of the world 16-28 working days. Please note that ConsciousTee is not held responsible for any additional custom charges that may emerge. How are my orders sent? We use Royal Mail to dispatch most of our orders. What do you use to ship your orders? From mid-April 2017 we've started using 100% recycled mailing bags to ship the big majority of our orders. We are working on making this possible for all of our orders. Do you offer free shipping? We offer FREE international shipping on all orders over £100. Where are your products made? Our t-shirts are printed and embroidered in England. The organic cotton t-shirt itself is made in India. It is certified by the Fair Wear Foundation and the Global Organic Textile Standards. What ink is used to print your t-shirts? We use eco-friendly water-based inks to be kind to the planet! Why organic cotton? Organic cotton doesn't use harmful pesticides or insecticides. It is therefore not so harmful to the lives of the farmers producing it. What charities are you donating your profits to? From the items of our core collection, the current charities that we are donating to are Viva, Farm Animal Rescue, and Friends of the Earth. Other tees will have a specific charity assigned and this can be found in the product description. If you are a charity and aim to promote a similar message to ours, please get in touch (hello@conscioustee.co.uk). We'd love to hear from you! What is the thickness of your t-shirt? Our t-shirts are not super thick, nor are they super thin. They are somewhere in the middle at 145-150g. Why are your t-shirts labeled as Men's and Women's? We simply want to indicate that one t-shirt is broader on the shoulders and the other is more slim. But, you can wear whatever you want! If you are a man and want a "women's" t-shirt, that's great! And, if you are a woman and prefer the fit of a "men's" t-shirt, that is cool too! Wear whatever makes you feel good! What is ConsciousTee's mission? Our mission is to empower individuals to live a happier, healthier, and more conscious life. Why vegan? For three simple reasons; the planet, the animals, and health. Eating animals and their by-products has detrimental effects on the environment. Animal agriculture is the leading cause of deforestation, it heavily contributes to green house gas emissions and water waste. Compared to a meat eater, a vegan produces 50% less CO2, and uses 1/13th of the water and 1/18th of the land (source: Cowspiracy). Additionally, animal agriculture requires large amounts of land and resources that could be employed more efficiently to feed the world's hungry. 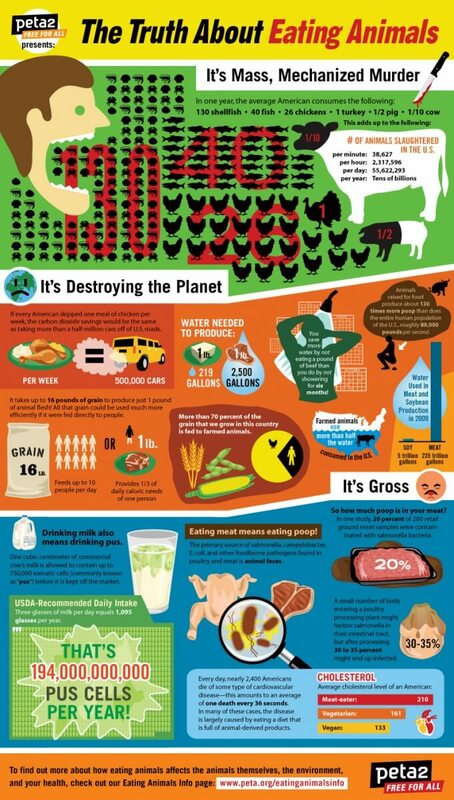 This infographic on Feeding the Future summarises the importance of a vegan diet to combat world hunger. Apart from having a positive impact on the environment, a vegan approximately saves 100 animal lives in a year, whilst improving his/her own health. Due to its lower content in saturated fats, a vegan diet decreases the chances of cholesterol and reduces the risk of breast, prostate, and colorectal cancer. I want to learn more about veganism and the impact it has on the environment, the planet, and my health. What can I do? Firstly, being open-minded and having the desire to learn are two amazing qualities to have in life, so hats off to you! The easiest and fastest way to learn more about veganism would be to watch documentaries or videos. You can start off by watching Gary Yourousky's Best Speech You'll Ever Hear and the TED Talk on Carnism by Melanie Joy, Harvard educated psychologist. If you are interested in the environmental side of veganism, Cowspiracy is eye-opening. Earthlings exposes the more ethical side of veganism. Finally, regarding the health aspect of veganism, Forks over Knives is a great documentary! Veganism is a learning process and ultimately you just have to do what makes you feel good! I absolutely love your brand, how can I get involved? E-mail us at hello@conscioustee.co.uk if you are interested to collaborate with us, stock our product or give us any type of feedback on how we can improve! My question hasn't been answered, what can I do? We love humans and we love questions! Contact us at hello@conscioustee.co.uk.